Everyone knows that eating healthy is the best option available for making a positive impact on your health. It can help you maintain a healthy weight, stay fit and just feel better overall. Knowing that you need to make good food choices is different from actually making those choices. When you are ready to change your eating habits, you need to take the time to evaluate all of your habits and to take the necessary steps so that you can embrace a healthy lifestyle. You need to think about the food that you are eating, where it comes from and how it helps you. Once you begin to make conscious choices about your eating habits, it will be easier to make the changes you need to succeed. The government and various other nutrition agencies have outlined the basic guidelines for healthy eating. As a child, you may have learned about the Food Pyramid or heard about the My Plate initiative. The basic guidelines instruct an adult to eat about two cups of fruit a day. You should strive to eat between two and a half to three cups of vegetables each day. You should limit your grains to between six to eight ounces each day. Protein is an important part of any diet, and you should aim for between five to eight ounces each day. If you do not want to eat meat, there are plenty of healthy plant based proteins options available. Dairy is another important food group, and you should make sure you are getting about three cups each day. You also need to make sure you are choosing healthy fats and oils such as the oils found in nuts or certain vegetables. You need between five to seven teaspoons of oils each day. Once you understand what you should be eating to stay healthy, you need to start thinking about how to eat each of the food groups. The fresher the fruits and vegetables you eat, the more nutrients you will receive from them. 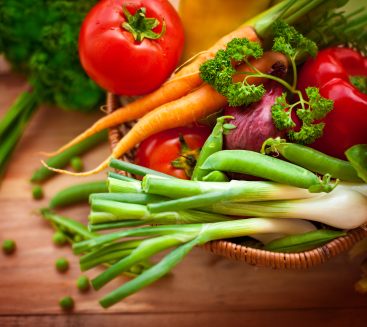 If possible, you should eat at least a portion of your daily vegetable intake raw. This will give you the most nutrients possible. When you are eating your grains, look for whole grains instead of items that have been overly processed. Choosing to bake or grill your meat will be healthier than frying it. You can choose organic fruits and vegetables to avoid the pesticides that are on other fruit. Changing your eating habits may come a little bit at a time. You need to make it easy to consume the healthy foods you want to eat. Take the time each week to slice up the vegetables you are planning on snacking on. Take the time get rid of the processed junk food in your house, and at your office. If you put healthy options in their place, it will be easier to make the changes. The more processed food you can remove from your diet, the better off you will be. Cooking from scratch and cutting out fast food will give you more control over the food you eat. Changing eating habits can be difficult. Food addiction is a real affliction. You may not realize that you are addicted to many of the processed foods that you eat. Some people find that completing a detox diet of eating only fruits and vegetables and lean meats for a few days can help break some of the worst eating habits. If you do this, you will slowly add in whole grains after one or two days. One of the goals is to completely eliminate processed sugar from your diet. Another approach is to only eat sugar on specific days each week. You may slide as you begin to change your eating habits. The key is to not give up when you make a mistake. Resolve to begin eating better again, and then stick to it. Your body will adjust to the healthy foods that you are eating, and soon you will crave fruits and vegetables instead of sugary snacks and potato chips. If you are still having a difficult time, you should consult with a professional nutritionist. Check with your health insurance company to see if they will cover the cost for one or two appointments, especially if you are overweight. Here is additional information on making healthy food choices. Eat Right: What Healthy Food Choices Should I Make? Does Eating Healthy Really Cost More?